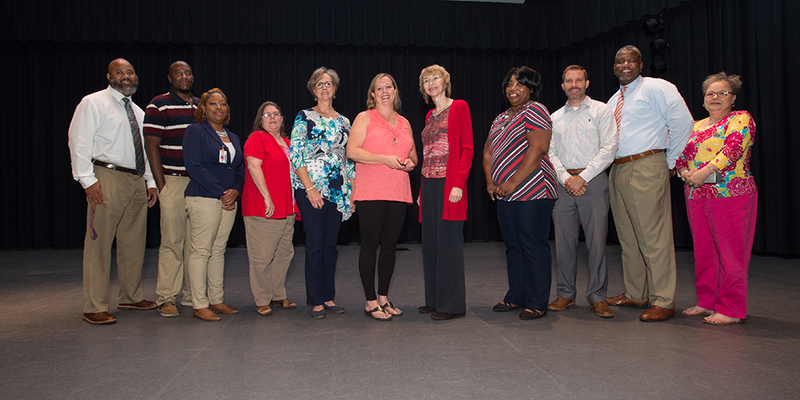 Congratulations to Edgecombe Community College employees who received Service Awards at the College’s recent fall semester kickoff for employees. From left are Ulrich Hill, coordinator of the Student Success Center on the Tarboro campus, who was recognized for one year of service to the College; Thomas Bracy, coordinator of the Student Success Center on the Rocky Mount campus, one year; Kienesha Ebron, Student Services administrative assistant, one year; Angie Estes, Financial Aid advisor, one year; Debbie Batten, controller, one year; Heather Smith, Health Occupations instructor, one year; Debra Hornbacher, Radiography clinical coordinator/instructor, five years; Dalanda Bond, data, GED, and research specialist with College and Career Readiness, five years; Brad Hill, network administrator, fifteen years; Tony Rook, dean of enrollment management, twenty years; and Charlotte O’Neal, Student Services administrative assistant, twenty years. Carl Shearin, maintenance, ten years, was unavailable for the photo.